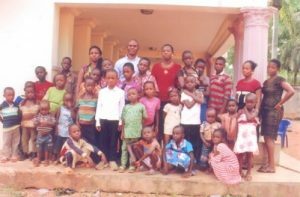 During the year 2015, as the political situation in Nigeria worsened, two families worshipping with Glorious Fire Ministry in Lagos relocated to Enugu. 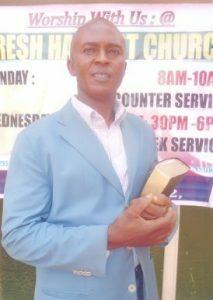 Brother Emeka who was into prison ministry, met with them once a month to pray and seek the way forward. The meeting place was Brother Emeka’s living room. Whenever we met we pray, sing, share the Word, and thereafter, listen to each other’s experiences. We also shared meals in what was tagged Love Feast. It was in January 2016 that the idea of meeting weekly came out of a desperate need of helping the new families settle down. Some joined the prison ministry while undergoing skill acquisition training. Meeting time was Sunday by 3PM. The group was soon thrown out of Brother Emeka’s family house. But the light was already in our eyes and with help from Pastor Fred in Lagos and Pastor Jorge and the entire Zion Harvest Church in America, we soon found ourselves worshipping God again in the beauty of His holiness. Today, Fresh Harvest Church, Enugu, is a branch of Fresh Harvest Church, Incorporated with headquarters in Lagos. Numbering about 50, the church is populated with mostly young people. While the prison ministry is strong and visits inmates of Enugu, Nsukka, and Oji River prisons, the Evangelism team is quickly rising as a service unit and plan to take over Enugu in series of crusades and outreaches this year of the Lord, 2018.